You don't need to drink tonight, even if it feels like your country is burning to the ground. Why choosing not to drink on election day 2016 was the most subversive thing I could have done, and why it is just as powerful and relevant to me today as it was two years ago. Bright-eyed and bushy-tailed, I was just shy of 2 months sober. I left my house wearing white and drove a short distance across my neighborhood to vote. I checked a few boxes and got me that ubiquitous red, white, and blue sticker that I’d wear as a badge of honor for the rest of the day. It read “I voted,” but it said, “I am part of this.” I took a selfie, posted it to instagram with some feminist words underneath, and waited for “likes” from my sisters-in-arms to roll in. I recall quite literally tearing up, truly believing that this day was some sort of pivotal turning point in the decades long (I now realize whitewashed and not at all intersectional) feminist movement. I felt grateful for being there for it, playing a small role in it, and for feeling wholly present. I hummed the tune of sister suffragette. God I must have been annoying to be around, a caricature of the young white female feminist voter. I didn’t hold any delusions of grandeur that the election meant the world was on the verge of becoming the light-filled feminist utopia (land of breast-milk and honey?) of my dreams, but I WAS positive that we were in the midst of a huge cultural shift. As it turns out, we were absolutely shifting, but NOT how I anticipated. In the early evening, as exit polls began projecting what the mainstream media had missed, my social circle refused to see as a possibility, and I still could not bring myself to believe, I began to feel physically uncomfortable (I’ll add here that not everyone missed it- the election results yielded little if any surprise in black communities). Anxiety showed up taking the form of what felt like a brick of wet clay in my stomach and a tightness in my chest that wound up my now bone-dry throat. I couldn’t relax my face, unsquint my eyes, or unclench my jaw for more than a few seconds at a time. My heartbeat was louder than my breathing. But everything was going to be fine. I drank a glass of water. I wanted wine. I turned off the news and took a walk during which I sweat far more than my level of exertion called for. A few hours passed. The inconceivable became starkly real as I watched a man who (to me) represented some of the most vile parts of humanity and the dark underbelly of American culture win his bid for the highest government office in the United(?) States. It was a tasteless joke with no punchline. My friends and I took it in the only way we knew- by making politically incorrect jokes, bashing the president elect, considering a handful of “but maybe…” scenarios, and if I’m completely honest, more tears. They were drinking, some of them heavily, I was not. This didn’t bother me at all- their drinking was their thing, not at all entangled with my own. Aware that I was freshly sober, they placed no pressure on me, but the looks on their faces said, “are you kidding me, you furreal aren’t going to drown your sorrows in whiskey right now? ?” It was an easy look to read because it matched my internal dialogue. My thoughts drifted to how easy it would be- how understandable it would be for me to have a couple drinks with my friends to quell the unease in my stomach, my heart, and my mind. I turned a cold shoulder to those thoughts and began to sift through what was beneath them. In the short amount of time since I had stopped drinking, I also spent a significant amount of time digging in to my subconscious beliefs surrounding alcohol and as a result I hadn’t really been dealing with cravings (thank you, This Naked Mind). This is to say that my discomfort was layered. On the most obvious level there was the physical and emotion response to the stressful situation I was in, and beneath that there was the unease I experienced on realizing that the URGE was back. Why did I want to drink right now? Same old reasons I suppose: It was easy. It was comfortable. It would take the edge off my fear and anxiety. It would make me feel safe and warm. But something about all that felt inside out. I recognized the urge as counter-intuitive but I needed to FEEL it, not just recognize it. I sat in it a little longer and let the answer rise in me. I ended up giving myself permission to drink that night. In my outrage I chose not to. In that moment, my sobriety shifted away from being an act of deprivation to an act of defiance, even if I was the only one who knew it. What bubbled up was the realization that to drink at this would be to give in, and to give away my power. Not drinking that night was the only thing I could do to stand up for what I believed in, and I clung to it like a sailor embracing the mast of a sinking ship. Not drinking said I will not numb one second of this. I will not be passive. I will not incapacitate myself to any degree in order to accept things as they are, not even for a few hours. I will drink in every ounce of the uncomfortable that is offered up to me before I drink to pretend it isn’t. It said I will do everything in my power to fight what you represent. It said I will not dull the sharpness, I will rise to meet it. I will be here with all of my disgust, I will be here with all of my rage, most importantly I will be here with all of my love. It said I do NOT concede. It said I do not turn myself off for you. Today is another big day. Things haven’t gone the way I wanted, and I’m feeling distrustful of a government meant to protect me. Once again I am feeling stressed, discomfort, anxiety, and unease. Once again, I am making the choice to not turn off for anyone who wishes me (us) silent. 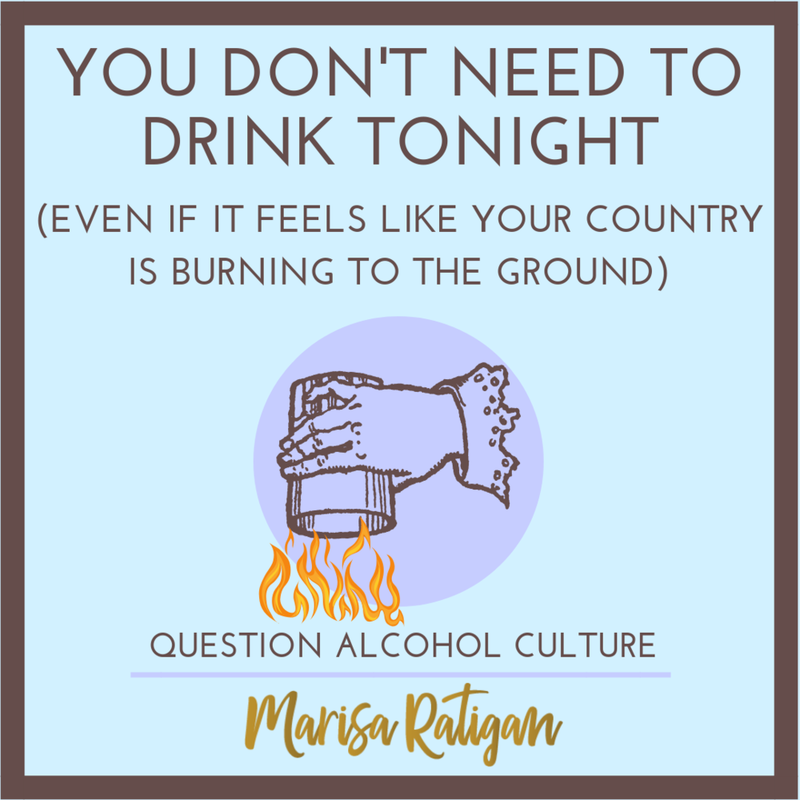 ***The little meme I made up top asks you to “question alcohol culture.” What do I mean by that? “Alcohol culture” or “alcohol-centric culture” appears in many forms. It is the expectation that the normal response to stress is to drink, that an alcoholic drink is necessary for both celebration and defeat, that rose is required in order to fully enjoy a beautiful spring day. It is the existence of events that promote both alcohol and wellness at the same time (imagine if your yoga studio hosted a yoga and cigarette night?) It is seeing more women’s birthday cards involving a joke about wine/vodka than not, despite the fact that Alcohol Use Disorder rose 83% among women from 2002 - 2013 and continues to rise. Maybe it’s not funny. Have you ever noticed that alcohol is the only drug you need to have a reason for NOT doing? It’s also the only addictive drug that DOCTORS en masse often suggest moderating rather than stopping altogether when there is a problem (real question: was there ever a movement for moderating cigarettes?) This is NOT about shaming anyone for drinking. This is about empowering. I don’t think everyone needs to stop drinking, and I not a prohibitionist. Decide for yourself. I AM suggesting that we educate ourselves, question the role alcohol plays in our culture and our lives, and try to wrap our heads around the answer to the even bigger question, which is: who benefits when we consume? If you wish to learn more about anything I touched on, here are some of my favorite teachers and resources. These women got the conversation started and paved the way for me and others to join in.